Mailed 8/20/14 to Subscribers. Allow 4-6 weeks for USPS delivery. 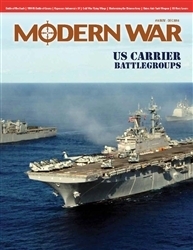 US Carrier Battlegroups: During & Since the 1980s. US Navy carrier operations underwent a transformation late in the 1970s, driven by Soviet naval expansion and America’s withdrawal from Vietnam. Grozny 1994: The Russian army fights a hard battle against determined insurgents and learns new lessons about urban warfare. Khe Sanh: The epic siege of the US Marine Corps combat base at the end of the line. Flying Wings: During the 1950s, the US Air Force took to the skies with revolutionary new aircraft. US Navy Lasers: Space Age weaponry is now being mounted on US warships. Indonesian SF: Elite forces take on terrorism in the South Seas.